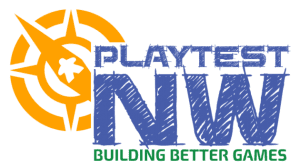 Blue Highway Games, 2203 Queen Anne Ave. N.
Join us every 1st Saturday at Blue Highway Games in Seattle from 1pm to 5pm to playtest prototype board games from indie tabletop game designers. If you love playing board games or want to learn more about the game design process, this event is for you! Enjoy an afternoon of playing games, sharing your feedback, and meeting indie game designers in our community. Please RSVP so we can see you there! Drop-ins are most welcome!